This category rearranges objects in a drawing. At the moment there is just one extension in this category. This extension changes the z-order of objects based on their position on the canvas. A variety of parameters control how the restacking is done. 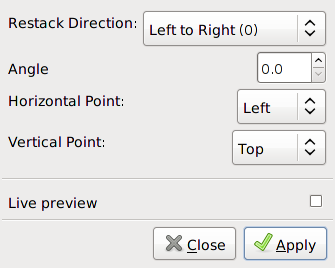 The Restack Direction is set by a drop-down menu in the Restack dialog. Options include: Left to Right, Bottom to Top, Right to Left, Top to Bottom, Radial Outward, Radial Inward, and Arbitrary Angle:. In the last case the angle is given in the Angle entry box where the angle is defined counterclockwise with zero corresponding to left to right. The last two parameters control which point of an object's bounding box is used in the restacking process. The dialog for the Restack extension. An example of using the Restack effect. From left to right: An array of overlapping circles created with the Create Tiled Clones dialog. Restacked with direction Bottom to Top (90). Restacked with an Arbitrary Angle of 135° Restacked with direction Radial Inward.